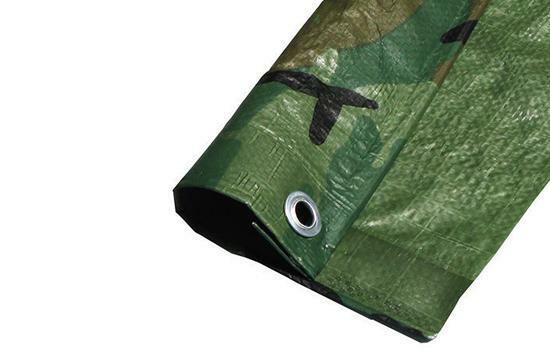 This camouflage medium-duty poly tarp is suitable for a variety of uses. Featuring a 10 x 10 mesh count, this tarp is 8 mils thick and 4.8 ounces per square yard. 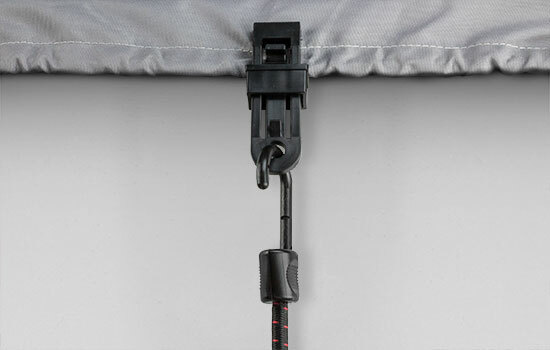 Aluminum grommets are spaced about 36 inches apart, providing plenty of spots for tie downs. Waterproof and rotproof, this quality tarp also gives 100 percent protection from the sun's damaging UV rays. Reinforced corners and rope-reinforced edges add to it's durability. The medium duty camouflage tarp is versatile and can be used in many commercial and industrial applications that include roof covers and equipment covers. These tarps should be your first choice for any application that requires protection from the elements. They offer a simple and economical cover solution for valuables and are useful in outdoor recreational activities like camping. These tarps are perfect for patios and patio furniture too, but you'll also find dozens of uses for them around your home or business. They're so light and inexpensive that you might even want to take a cover along in your car or truck for emergencies.